The Copper rod upcast continuous casting machine is used to produce the long and bright oxygen-free copper rod. The induction melting furnace melt the copper cathode into liquid, the liquid keeps off the air by charcoal or graphite flake in case of be oxidation. The induction holding furnace keeps the copper liquid temperature in 1150℃±10℃, the casting machine crystallizes the copper liquid in crystallizer quickly, then continuously produces copper rod, then the final product will be finished through the double head take up machine and other accessory equipment. whole furnace, it is fastened on the foundation by ground bolt,inductor composed of coil, water jacket, iron core and copper channel.The high voltage side of the inductor（primary）includes coil with cooling water, the voltage could be adjusted form 90V-420V（holding furnace is 90V-380V), the low voltage side of the inductor（secondary）includes short circuited copper channel, after electrifying, it will produce big current in copper channel with the action of electromagnetism induction, and melt the copper channel and also melt the cathode at the same time .Water jacket and coil all need to be cooled by water, the water can be recycling used, and is supplied by the cooling water system. The continuous casting machine is the main part to realize the continuous upcasting which includes the traction system, the level tracking system and the crystallizer, the structure is gantry four pillar. The traction system includes two units of servo motor, reducer and traction rolling wheel, it could make 0-600 times high speed interval motion and make the copper rod come up though the traction rolling wheel, each unit of traction system could drive 6 pair traction rolling wheel, and drag 6 pcs copper rod separately. The automatic level track system could insure that the crystallizer is in the stable depth in the copper liquid, and to make sure the producing is continuously. The crystallizer could freeze the copper quick into solid-state by cooling it and realize the heat exchange, each crystallizer can be change and be controlled separately without any influence of other crystallizers’ normal working. The output frame is set up on the upper part of the casting machine. It includes the platform, the support, the vertical guide wheel and roller. It separates and feed the casted rods into each double head take up machine without influencing each other. The take up synchronizing device is a device which is set up between the output frame and the double head take up machine. There are twelve units of displacement transducers and swing link. By controlling the angle of the swing link, the speed of the take up machine can be controlled with high accuracy and high sensitivity, meantime it can supply the reliable signal for the automatic control. 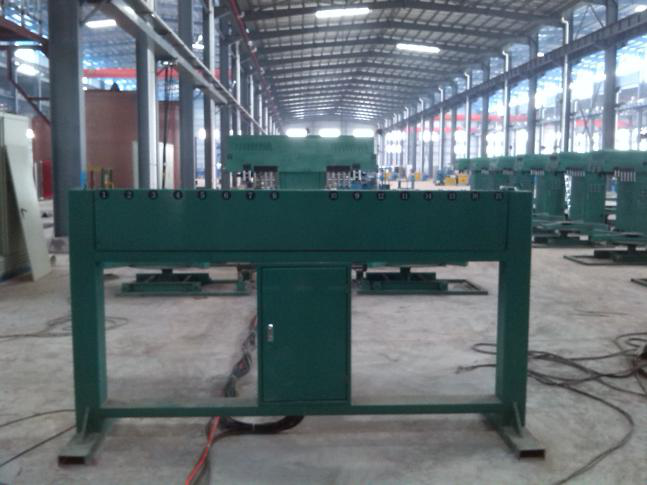 The double head take up machine includes the traction roller, the coiling device and the coiling plate. Each unit of the take up machine includes four or three motors controlling the two sides of take up device for two rods, the max coiling weight is 3.5ton. The electric control system includes the power system and controlling system. The power system supplies the power to each inductor through several power panels. The control system assures the normal producing, the recording and displaying of the data. The detail recording and displaying information is inductor voltage, current, furnace temperature, water temperature(including the crystallizer water temperature), traction speed and traction distance etc. The feeding system feed the whole piece of copper cathode by the electric hoist. It assures that the copper cathodes is supplying to the melting furnace continuously. The temperature testing system includes two parts: copper liquid testing and water testing. The testing result is shown on both on the digital temperature meter and the industrial control scream for producing monitoring.